The Telecom Regulatory Authority of India (Trai) has now come up with its own portal to display the network coverage of telecom operators in a particular region. This move comes after the unveiling of tariff plans portal and the network coverage portal is a much-delayed one from the sector regulator. 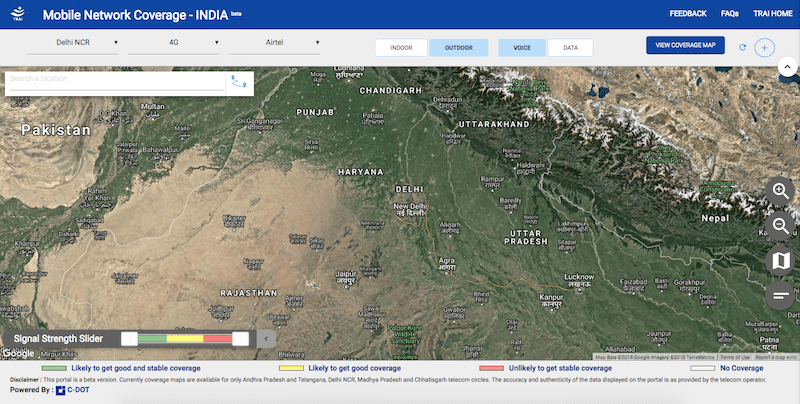 The portal can be accessed at www.coveragemap.trai.gov.in currently is in beta stage as the regular is still in the phase of collecting data from telcos. At the moment, the network coverage in Delhi and MPCG (Madhya Pradesh & Chhattisgarh) circles has been listed on the portal. Trai stated the portal has been launched on a pilot basis with obtained data from carriers in both the circles. Until now, telcos have been offering network coverage checking service to the consumers of their own. Operators such as Airtel, Idea Cellular and Vodafone have already opened their own portals allowing users to check the network coverage in a specific region or in their current location. But Trai wants to bring all the telcos network coverage into one portal, and that’s what the new pilot service is all about. Trai also stated that it collaborated with CDoT (Centre for Development of Telematics), which is the government body involved in implementing original telecom solutions to build this portal. This move will also help users looking to join a new service provider. For example, if a user is looking to get a new SIM and they’re confused which one to go for. They can open the Trai’s portal and check for the network coverage in their region, which will allow them to choose the operator accordingly. “On this interactive user-friendly portal, users shall be able to select various options like location, indoor/ outdoor, TSP, technology (2G/3G/4G VoLTE), voice/data to know the coverage provided by the particular carrier at the location of their interest. Also, users shall be able to compare telcos based on coverage and signal strength or no coverage area, etc,” Trai said while launching the portal’s beta version on Thursday. Also, Trai stated that the beta release website is capable of handling only 50 users at a time. If users jump onto the portal at the same, then it will ask the users to visit after some time. “This is a heavy data portal includes visualisations of the network at 50 mtr resolution and simultaneous comparison of the network between two operators. During the beta release, portal shall permit up to 50 concurrent users. If there are more than 50 users they will get a message to access the portal/website after some time,” the regulator said during the launch. Trai is currently looking for feedback from consumers and stakeholders to improve the portal. To help the portal get better, Trai will be seeking required coverage data from the telcos, and the data will be updated on a regular basis. @kirti needs this very much to come out of that frog delhi centric world.